I know Christmas is coming, but please allow me a few words about St. Patrick’s Day. That day of merriment in honor of the patron saint of Ireland has, for as long as I can remember, appealed to Irish and non-Irish alike. When I was growing up in Youngstown, there was no St. Patrick’s Day Parade. When radio personality Pete Gabriel — of Greek ancestry — came to Youngstown, he couldn’t believe there was no St. Patrick’s Day Parade. So he started one, reasoning that almost everyone, no matter their ethnic or religious background, enjoys celebrating St. Patrick’s Day. For perhaps a century or more, that was the case with Christmas. One December I went to a Neil Diamond concert at the old Coliseum in Richfield, Ohio, where he sang Christmas songs, including some in Latin. “Growing up in Brooklyn I always loved Christmas,” Diamond told his audience. I personally know Jewish people and even atheists who enjoy celebrating Christmas. I first noticed it during the 1986 Macy’s Thanksgiving Day Parade. Santa Claus, who traditionally winds up the parade, proclaimed: “Ho, ho, ho. Happy Holidays.” That went on for a few years until, I assume in response to protests, Santa began just silently waving. Nevertheless, the Never Christmas campaign began to dominate TV, movies and everyday conversation. Advertisements full of Christmas decorations — the tree, Santa, etc. — and instrumental versions of Christmas songs appealing to you for your Christmas shopping scrupulously avoid mentioning Christmas. 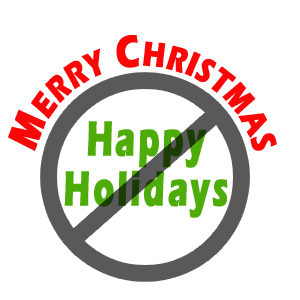 “Happy Holidays” goes the bland, obligatory, evasive greeting — as though the idea of Christmas is something to avoid. It’s easy to criticize that Never Christmas mentality — and believe me, I have. This aversion, according to some surveys, is felt by only 5 percent of the public, but that 5 percent has been able to foist this odd sort of intolerance on the rest of the country in the name of tolerance and inclusion. Of course, I’m all for being sensitive to minorities and being inclusive. Yet the irony is that Christmas is perhaps the most inclusive of holidays. People of different religious beliefs or no beliefs are free to enjoy the sights and sounds of the season without anyone really caring about their beliefs. They can enjoy it while those of us who believe in Christmas are making the preparations. Christmas is so inclusive that parallel celebrations of Hanukkah or Kwanzaa are welcome. In fact, Knights of Columbus councils have invited Jewish congregations to set up menorahs by their Nativity scenes. Ironically, the Never Christmas crowd doesn’t seem to mind explicit celebrations of Hanukkah or Kwanzaa. Of course, the religious dimension to Christmas — the true source of Christmas joy — must never be lost, but anyone can share in that joy without believing. No one is forced to celebrate Christmas any more than anyone is forced to go to a Super Bowl party. And if you’re at the Super Bowl party, you don’t even have to watch the game. Trying to reduce Christmas to “the holiday” is really the opposite of pluralism and multiculturalism. It is trying to hide something that has touched hearts in a way that the “the holidays” can’t. There’s that wonderful story from World War I, when on Christmas Eve 1914, soldiers in the trenches began singing Christmas songs. Soon, soldiers on both sides were crossing the trenches into the enemy camp, making Christmas decorations, giving presents and playing a game of makeshift soccer. Eventually, hostilities resumed, but that brief shining moment will forever offer hope for something more. I doubt that celebrating “the holidays” would have touched the battle-hardened soldiers’ hearts so deeply. Pete Sheehan is editor and general manager of The Catholic Exponent, newspaper of the Diocese of Youngstown, Ohio. NEXT: Mom and Dad’s Christmas: Humbug or happy?